Because larger (> 50 MB) data files cannot easily be committed to git, a different approach is required to manage data associated with an analysis in a GitHub repository. This package provides a simple work-around by allowing larger (up to 2 GB per file) data files to piggyback on a repository as assets attached to individual GitHub releases. These files are not handled by git in any way, but instead are uploaded, downloaded, or edited directly by calls through the GitHub API. These data files can be versioned manually by creating different releases. This approach works equally well with public or private repositories. Data can be uploaded and downloaded programmatically from scripts. No authentication is required to download data from public repositories. See the piggyback vignette for details on authentication and additional package functionality. Downloading from private repos or uploading to any repo requires authentication, so be sure to set a GITHUB_TOKEN (or GITHUB_PAT) environmental variable, or include the .token argument. Omit the file name to download all attached objects. Omit the repository name to default to the current repository. See introductory vignette or function documentation for details. ## We'll need some example data first. piggyback acts like a poor soul’s Git LFS. Git LFS is not only expensive, it also breaks GitHub’s collaborative model – basically if someone wants to submit a PR with a simple edit to your docs, they cannot fork your repository since that would otherwise count against your Git LFS storage. Unlike Git LFS, piggyback doesn’t take over your standard git client, it just perches comfortably on the shoulders of your existing GitHub API. 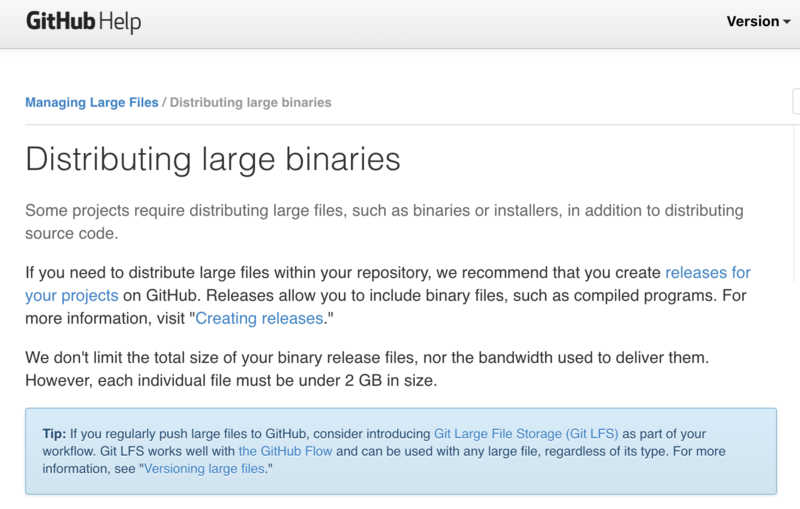 Data can be versioned by piggyback, but relative to git LFS versioning is less strict: uploads can be set as a new version or allowed to overwrite previously uploaded data. But what will GitHub think of this? Of course, it will be up to GitHub to decide if this use of release attachments is acceptable in the long term. Also see our vignette comparing alternatives.